In 2012, the South Park Improvement Association commissioned a certified arborist to assess the health and structural condition of all the trees that ring and grow within South Park. Of the fifty-two (52) trees surveyed, five (5) were found to be in poor condition. And only two (2) were recommended for removal. Late last week, at least thirty-three (33) of the trees were tagged for removal as part of the City’s South Park Improvement project, including around half the mature trees that currently ring the park. So there is nothing wrong with the trees, but they just want to get rid of them? They should figure out how to remove the transients and homeless that call that park home before they start removing trees. I think the City’s parks department has been taken over by people who think the epitome of an urban landscape is a suburban parking lot with drought resistant weeds growing under short trees which are replaced every five years. Seriously. Why does the City Parks Department hate trees so much? Are they just trying to reduce their own maintenance work? It can’t be that. They don’t do any maintenance work. They dont have the budget to take care of them so they are getting chopped down. The department has plenty of money to waste on studies and surveys and consultants. They’ve just given up pruning and cutting and watering and fertilizing. There are 3 categories of trees; those that are dead or dying (more than 20; the falling material has hit people and cars for years), those that have to be removed for the renovation and those that are remaining. This article is factually inaccurate. Why don’t you ask the South Park Improvement Association which did the studies along with Parks & Rec. While the count of tagged trees is ours alone, the other facts and counts in our report are based on the South Park Improvement Association’s commissioned study, a direct link to which is provided above. If there’s a newer Certified Arborist’s report, it hasn’t been added to the supporting documents on Rec & Park’s official project page. I’d rather figure out a way to remove ignorant and hateful people like you from the city. Then, we can really start addressing the issues that plague our city. Addressing the issue of transients and homeless in South Park is “hateful and ignorant”? I’m literally giving up on this City – we’ve come a long way from “the city that knows how” – now it’s just the city that screws up everything it touches. Trees are actually shown in the renderings – visuals used by the locals to approve whatever is supposed to be done to the park – and yet they’re going to be taken out? It’s not that difficult. The new park will still have trees. They will just be different than the current trees. Yes they’ll be teeny tiny little trees that will take *decades* to grow into mature trees that actually provide usable shade, noise filtering, etc… and of course that’s assuming that homeless & hoodlums don’t kill them, as is done to about 50% of the new trees planted in GG Park or along Park Presidio. The decision to cut down mature and healthy trees is stupid, and there’s no icing you can put on that to make it sweeter. You’re *just now* giving up? The “city that knows how” died a long time ago thanks to the unholy alliance of NIMBYs and Progressives. was that before or after moscone? Seriously this whole improvement project is dubious—as someone who has worked in the area for 5 years, the park actually operates quite well and seems loved by neighbors. From the designs and statement that have been made public, it certainly looks like the architect and planners want to make it into some kind of corporate plaza for the tech lunchers. And no trees ?! Well of course they do. 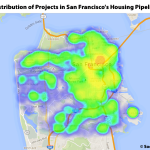 That’s the City’s plan – to turn SF into one giant corporate tech campus. Much like our neighbors in South Bay, the City wants the jobs far more than it wants the housing. I live around the corner and agree, the park is heavily and well-used and I’ve personally never thought it required renovation beyond regular grass maintenance. I have stayed out of the community discussion, however, as the new park seems like it’d provide the same functions to neighbors and area workers. But the new plans also, as mentioned, rely heavily on the existing mature trees. I’ve emailed Mary to ask for an updated arborist report, will post back. This happened in Golden Gate Park a couple of years ago. If the rationale is the same, then perhaps the city’s arborists see dangers where we don’t see them (or the one hired in 2012). 3 years of drought could have also exacerbated conditions. And yet the lone Monterey Cypress at 300 Moncada Way whose roots have caused $21,000 worth of damage to sewer pipes, sidewalks, and neighbors property, remains protected by the Dept. of Public Works. I don’t understand how we can be doing this, can anyone help explain this? It would be good to understand the source of the deltas between the latest certified report by an Arborist and the certified report by an Arborist completed on behalf of the South Park Improvement Association in 2012? There isn’t a delta as the only Certified Arborist report was completed in 2012, as we reported and linked above. easier to get a seemly healthy mature tree removed in a park than it is to remove a non-native species tearing up a nearby foundation. crazy. Wow, so in 2012 a certified Arborist said all of the fifty-two (52) trees surveyed, five (5) were found to be in poor condition. And only two (2) of the fifty-two (52) trees were recommended for removal. And now the City has indicated at least thirty-three (33) of the trees are to be removed without any determination from an Arborist? I don’t understand how we can be doing this? Just like when the canopy was removed in downtown Palo Alto a few years ago or the trees outside of Embarcadero 4 adjacent to JHP. Just like that. The new trees will take decades to provide a comparable canopy. Then again, the city has forked out a ton of $ on non-native palms which aren’t doing so great in many spots. Basically, someone paid off the city to go ahead with the tree removal to serve their best interest. What is the interest though? It sounds like the intent might be to plant different trees. The concept plan highlights several tree varieties that are not currently in the park. I find it sad though that they are going to remove so many healthy trees. Particularly since the Arborist report can really only justify the removal of 3-5 trees. Echo many of the comments above. Aside from some accessibility issues rectified by adjusting some curb heights along the perimeter of the park, I fail to see how the removal of 33 mature trees will help South Park remain as a quiet urban oasis. Doubtful that their replacements will have as generous of a canopy. Is the goal to bring it back to what it looked like in 1853? I guess ‘improvements’ is a euphemism for ‘killing tress’. So sad. But SF is more and more a dysfunctional city. As mentioned, it will take years and years for a canopy to re-emerge. Decades really. Most will have moved on by then and not get the chance to enjoy it. San Francisco has a beautiful natural terrain but the physical streetscape as built out,. its one of the least attractive in the US. Not just this spot or that spot but the majority of the SF physical landscape. From the Sunset to the Mission to HP. to Ingleside. One prime reason for this is the lack of trees, greenery and even small open space. It makes a difference – it really does though many here disagree. The palm tress – yeah right. The trees the City chose to plant a while back along Portola were inappropriate. Just like the palms are. i agree with the poster who mentioned some one must be getting a deal. Dave, you so often say such preposterous things that I frequently attribute them to mere trolling. Perhaps, it’s actually proof of what they say about San Francisco : you either love it or you hate it. You obviously hate it. But, does it ever occur to you as odd that annually millions and millions of people come from all around the World to experience this place? 33 trees seems like overkill to thin the existing overcrowding. And the “conceptual plan” for the new design shows all of the current trees less ~5 or so. 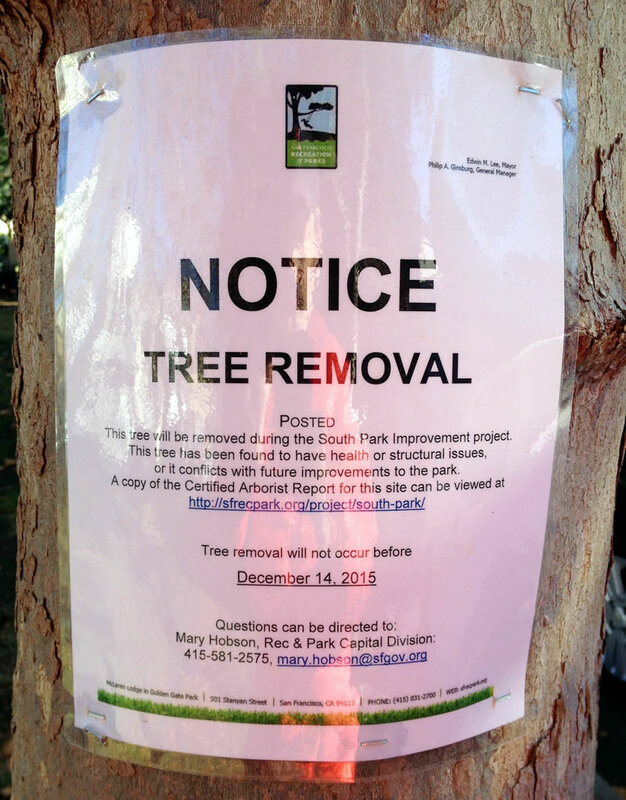 I’m not expert on these assessments or the workings of the official SF Tree Death Panels, but it seems that the arborist report would have lead to the removal of only a few trees if the park was not being remade, but as it is being remade extensively, the report also doesn’t prevent the city from removing most of the trees. I long ago concluded that San Francisco was an anti-tree city. Among the things that convinced me was when a new business moved in on the ground floor of my building and got approval to remove 2 mature street trees to make their new signs more visible (the trees long predated their signs). I had to protest the removal and waste an afternoon at a hearing to (successfully) block the removal. The bias is clearly to cut down any tree for any reason. South Park without the trees will just be another empty plot of ground. I sent my letter of protest. Have you? It’s sh*tty, but sometimes old things need to be removed, taken down, and replaced. The plans for the new park are terrible. They looked like they were created by someone who has never visited the current park. Go look at the parks that have been remade in the new style, whatever the heck it is. The “native grasses” are succumbing to weeds and, surprise, actual grass. The slopes are eroding. The bushes are dying. It’s a freaking mess. As a resident of South Park and someone who has participated in the park project process, I would like to make a few comments. The impetus for this project came from the community and it started back in 2007. The South Park Improvement Association consists largely of people that live directly on the park. The city, Rec and Park and Supervisor Kim have been great partners through this process. The money largely came from park bond measures. South Park was earmarked due to community involvement and due to the importance of parks for District 6 which sorely lacks open space compared to the city as a whole. The design and its impact on trees came through community input and was discussed in years of meetings. This didn’t just happen. While I am no arborist, I support the removal of the trees. Please come see for yourselves. Many of the trees appear sick and no longer bear leaves. Any time there is a large storm, large branches rain down in the park. The tree removal and replacement will also create more light which I would like to see. The overall design will make a huge difference to the neighborhood. South Park had been loved to death. In additon to the trees, the drainage of the park is poor, killing grass and rendering it a muddy field for days after rains. The plan will fix this. There will be more seating and more places to gather plus traffic calming measures and improved lightening. Overall this is huge for the neighborhood. If anything has been disappointing, it has been the utter lack of interest from the surrounding tech companies and VCs. This plan didn’t come from the city, but from the community. It wasn’t easy but the end result will be worth it. Thanks for the insight and first-hand account. Regarding tech companies and VCs. Has anyone reached out to them? More than just with a pamphlet or letter. But actually attempted to get in touch with them. I have a feeling they simply have not heard about it. Yes, we have tried. One of our leading park advocates met with a few of the VC honchos. She reported that they seemed interested and asked her to do a follow up. She did and was directed to their “customer relations department”. In other words get in line hun…. They all want to put “South Park” on their letter heads: Oh look at us we have an office on “South Park”. Aren’t we cool. But contribute…whole other matter. Of course there is that little matter of a record-breaking drought… pretty much every tree in the city looks bedraggled and unhappy – from my office right now it looks like every tree along Embarcadero is brown – but that’s no reason to go chopping them all down. Many if not most will bounce back just fine assuming we have a decent winter for a change. God forbid we might water our investment. Bad optics, I suppose… using water and all. its very disappointing that all these trees are being killed to give you more light. The only think that needs removing from this park are the constant homeless. The trees are great. The drawings show trees spaces appropriately around the park so that each tree hat ample sunlight and room to grow. The drawings do not say whether the trees are new or existing, they simply show where the trees will exist once the park is redone. Old/dead/dying/sick trees come out (including stump removal), remaining trees will get trimmed, and news trees will be added to match the plan. FWIW, there are a significant number of dead trees on the park that need to be removed and the three eucalyptus trees have trended to oversized broccoli stalks that, in a high wind, would be prone to falling on to ‘live’ power lines and homes across the street. They’ve long been a branch-shedding hazard. Change isn’t for everyone, but sometimes it simply has to be done to keep things from going to hell in a hand basket. South Park is long overdue for a rehab that will make viable for at least the next half century. The current stand of trees is not capable of that kind of longevity. Yes, it will change the flavor of the park somewhat, but give the new trees and other vegetation 5 years to mature and it will start to resemble its old self again — sans the people who trash it up every night by failing to put their empty meal containers, cans and bottles, and other trash in the trash cans that barely 10 feet away from where they’re abandoned. Go look at Jefferson Square, Alta Plaza, Lafayette Park. Check out their “rehabs”. Then consider how likely it is that anything R&P doing is going last 50 years. After reading the comments I get that most of the commentators are clueless about what is really going on with the park. Yes, trees are being removed, but trees are also being planted. My guess, none of those tree huggers live in the neighborhood or are most are new to the area. I also think that those who are expressing negative vibes on the proposal did not participate in the 10 or 20 community forums which have been going on for about ten years, Nor did they lift a finger to help the with fund raising efforts to improve the park or contribute one cent to help the cause. Nor have they lobbied the city and R&P for funds to improve the park. So be it. That’s OK we understand…your interlopers. You can’t help yourself from going full negative on something you know nothing about. 1) Founded 1854, turned over to the city around 1904 and mostly neglected from that point on. 2) Broken Children’s play equipment which is non ADA compliant and can’t be repaired because it does not meet current ADA standards. 3) Existing old wooden play structures which contain creosote wood preservative which has been painted over to minimize exposure by the users. 4) R&P refusing to allocate funds to maintain the trees, so none have been trimmed. Which causes limbs to break and fall during the slightest breeze. Four inch limbs which come falling and crashing down on to park benches or car windshields or passerby’s just minding their own business. 5) Many of the trees are dead or in poor condition from being planted to close to each other and not being trimmed on a regular basis. Tree root systems are so planted close to the street that during heavy rains and winds some trees been uprooted and have fallen over. 7) Poor drainage which causes the park to become waterlogged during moderate rains. 8) Grassy areas trampled by dogs to a point nothing will grow because the ground is so compacted. 9) Poor lighting which is not energy efficient. Pole light bases decomposing from dog urination. 10) Hand me down trash bins with broken doors. 11) Limited seating on decomposing pathways. 12) Park so over run by office workers there is no place to sit to have your lunch brake. So give us a brake. Yes some trees are going to be removed. But new trees will take their place. Better suited trees planted with better care. You had your chance to have your say over the last ten years. Those days are over. We are moving on and in 8 to 9 months the city will have a much better public asset for use by future generations of San Franciscans. The folks living in the three SRO hotels around the park will have a better living room to relax in. More open space to enjoy. More places to sit. Better safer children’s play equipment. A new irrigation system to better manage the water needs of the new trees and plantings. Traffic calming elements to slow down hurried drivers thoughtlessly rushing down the narrow streets on their way to the freeway. Instead of complaining and trashing the plan how about getting involved and contributing to our fund raising efforts so we can add in the few remaining items which will make park life better for all. Like a drinking fountain or additional traffic calming for the streets. We could really use your help. Remember South Park is a Public amenity. It’s your park. It’s everyone’s park. We want to make it the best little park in San Francisco. How about lending a hand? Are you sure you live in the area? I never see anyone using it as their living room in 2015, or speeding around the park. And what’s that cemented area at the nose of the park supposed to be? And so the solution to R&P neglect is to allow R&P to cut down the trees, and then plant new small trees (which BTW need maintenance! ), with the [trust?][hope? ][blind faith?] that this time around R&P will do the right thing? This is like someone failing to do any maintenance on a building, then asking for a demolition permit because it’s a danger. Granted at some point maybe things are too far gone and drastic steps must be taken; but the nay-sayers on here are doing so because they are aghast that R&P can basically allow this situation to exist, and yet be given the power to rip up what’s there now on the pretty promise of doing (shoddy) renovation work in the future. What about the Peregrine Falcons that nest in the park? If you read the notes from the two meetings posted on the Park and Rec website, you will read about “raptors.” Those raptors are Peregrine Falcons that according to the Ca Dept of Fish and Wildlife are considered endangered. I am really shocked that there wasn’t more investigation into this issue. This looks again like messed up priorities from the city. How about just keeping the park clean and well maintained. Look at what is currently being done to Glen Park village. A complete disaster. Poor quality work and ill advised design changes that have been ongoing for almost a year. How do they get away with it? A real waste of limited financial resources. What is this “Glen Park village” apparent project you reference? It’s almost reassuring to see other people flummoxed by the idea that there is a capital C “City Government” calling shots here. The Parks and Recreation department hardly gives a second thought to the Department of Public Works and the Urban Forestry therein. They own the trees, they cut them when they like. Parks and Rec has their own tree team with an arborist (“arborist”?). In my experience in the Richmond, Parks and Rec tree maintenance involves cutting down or completely topping trees every decade or so and planting new ones. Trimming is for holiday trees. P&R are trying to shed financial responsibility for trees worse than any aggrieved homeowner. A lot of the changes happening in the parks now relate to the enthusiastic spending of money from the “Safe Parks” (ADA Compliance) bond issue of what, two years ago? Ridiculous expenditures. We need safe parks that everyone can use. But short term capital pukes are no substitute for the regular maintenance that our resources deserve. Trees bad…glass condo towers and cemented “open space” good…. and it’s happening in several old parks or wooded areas. I bet they had community input…from people who apparently should have just moved to San Jose. I still get sad whenever I see Union Square. What a silly comment. Glad that you decide who lives where. A lot of the tagged trees haven’t had a leaf on them for a year or two or look truly sad. This park needs a major upgrade and this was discussed in supreme detail ad nauseam in community meetings for 8 years; meetings that were attended by the folks living in the supported housing, market rate housing, and business owners who operate on the park and the surroundings. I have been to many of these meetings, as a South Park resident. You apparently haven’t. If you had cared about the park you would have shown up. The invitations were all over the neighborhood, which you don’t visit that much, it appears. The park needs an overhaul, more seating, safe play structure for kids, proper lighting, and also a bunch of new trees replacing the ones that are dead, are dying and whose branches fall onto parked cars when the wind is blowing. My favorite part of South Park are the mature elms. Once more common, there are now few places in SF where we can see such graceful, trees: in Golden Gate Park, on Arguello, and along that beautiful stretch of Magellan, near Forest Hills. They are the epitome of a tree canopy: translucent enough to admit light, deciduous enough to allow winter sun to warm the sidewalk, and tall enough to make a street feel extraordinary. While I’m heartened to see “elm” called out in the new planting scheme (these are probably Chinese elms, a fine variant), they won’t attain the grandeur of the (ostensibly) healthy elms along the southern/eastern edge of the park in our lifetime. Mature elms became a rarity in the US after the Dutch Elm disease decimated whole urban groves, but SF was too remote from that infestation to the be as adversely affected…still, we had what were essentially injunctions against planting elms — even the disease-resistant Chinese elms — until recently. I hope an arborist can re-visit the plan to replace them. 1. Since then we have had some very harsh weather and a number of the trees have died, which were previously rated ok. The previously pillarded trees have severely weakened joints and are likely to break off, so each tree was evaluated. 2. The trees in the center of the park around the play are, which were planted in 2008, were twigs at that point and were not even rated. 3. The plan includes removal of all the Eucalyptus trees, since they were planted in the 80’s and do not below with the Sycamores and the Elms and are more likely to fail. 4. The Sycamores and Elms are planted too closely together in some cases for either one to survive. The design chooses between the two depending on the spacing and the life. 5. Lastly we are adding trees in the center as well as elsewhere. Totally unrelated to the article, but I love that the dog in the third panel is wearing sunglasses. “In response to the concerns expressed by you and other members of the public over the number of trees planned for removal from South Park, I felt it was important to provide more detail on the basis for the removal, and explain how the upcoming park renovation project will address both short and long-term urban forestry issues at South Park. The existing condition of the tree stock at South Park is mixed. The 2012 arborist report found only 5 trees to be in overall good condition (see Table 2). Overcrowding has resulted in the declining health of many, while the cessation of pollarding has left trees with structural defects making them weak and susceptible to failure. One of the primary goals of the South Park Renovation project is to address the aging and failing trees on the site by the following means, 1) removing the trees that are dead, dying or are unlikely to survive the impacts of the project, and 2) replanting the site with high quality, mature trees, that will provide long-term benefits to the park. To this end, the park renovation project will include removal of 28 failing trees. An additional 10 trees (5 of which are small and may actually be transplanted another Park depending on the assessment by the arborist) will be removed to provide open space for the new children’s play area, and to make way for the installation of new ADA accessible curb ramps at each of the four park entry points. I wanted to reassure you that along with removal comes replacement. The project will plant 24 new, mature trees (36” box-example shown below). Since a major contributing factor to the decline of the trees at this site is overcrowding, the new trees will be spaced at intervals appropriate for their species, so that they can grow large and healthy. As a result, the total number on the site will be reduced slightly. I also received a reply from the Project Manager, who was leading this effort at the time. For me, the response from the San Francisco Recreation and Park Department working on behalf of City & County of San Francisco addressed my questions in a very professional manner and lead me to believe I might have gotten caught in a hype cycle… I have included the response below. While it is certainly a a loss to lose mature trees in the city, retaining trees that are diseased is not the solution. On balance, I think the city teams did a good job here in supporting community questions and concerns. With the trees now removed and with construction underway it is time to support the efforts to make our city a more livable place.